The orchestras have been Oscar's ongoing project for a long time. Founded in 1986 by the violinist and conductor, they have become a prominent performing group for the public. The orchestras' concerts are frequently held at the local Winchester Cultural Center, thus gathering students and professionals alike. As before, it continues to do its part for the Las Vegas community. The Youth Camerata is a non-profit performing group. On February 20th, 1997, almost one year after the Cameratas 10th anniversary concert, the orchestra received a special recognition from Governor Bob Miller. The group was awarded the 18th Annual Governor's Arts Award in recognition of their outstanding efforts for the community and their service to the arts. Many well known professional musicians have joined in the Camerata's performances. Such performers include musicians like guest soloist Ruben Gonzales (Ex-concert master of the Chicago Symphony), Luis Grinhauz (Concert master of Montreal Symphony), Sherry Kloss (Student and Assistant of Jascha Heifetz), Juan Rostagno (Member of the LA Philarmonic), Oscar Lysy (Principal viola of Münich Orchestra), Myriam Santucci (Argentinian Cellist), Antonio Nuñez, Israel Chorberg (Concert master of the American Orchestra Ballet), Pianists Tamara Kezerov and Eduardo Delgado, and many more. The orchestra is currently preparing for its 25th anniversary concert. The alumni of the program will rejoin the group together with performers from all over the world to take part in the celebration. Click HERE to see a complete list of all upcoming concerts, events, and their dates. The Camerata performing at Winchester Cultural Center. 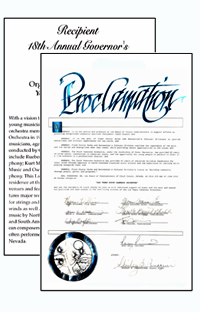 Click HERE to learn more about awards that the Orchestra has received.